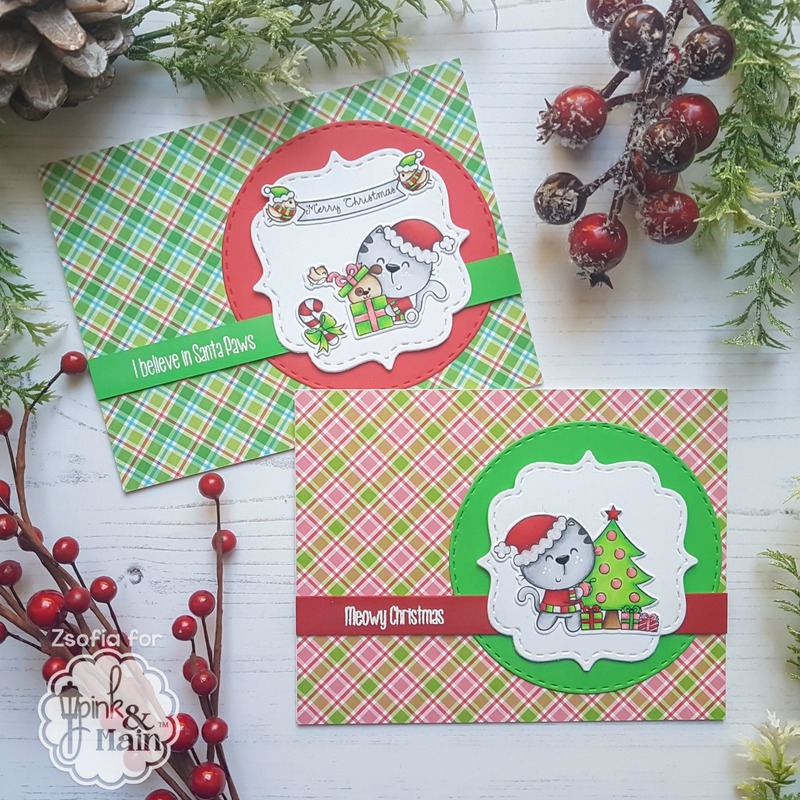 I must admit 2 things: i am in love with cute critter stamps and i am so behind my holiday cards (can you imagine that i have not sent them out yet???Ahh!) I want to feel that i am not alone with this problem, so i try to design cards which are easy to re-create. Today i pulled out an older set called Santa Paws. Adorable! I stamped the images on Copic friendly cardstock and coloured them with alcohol inks. I used the coordinating dies to cut them out. 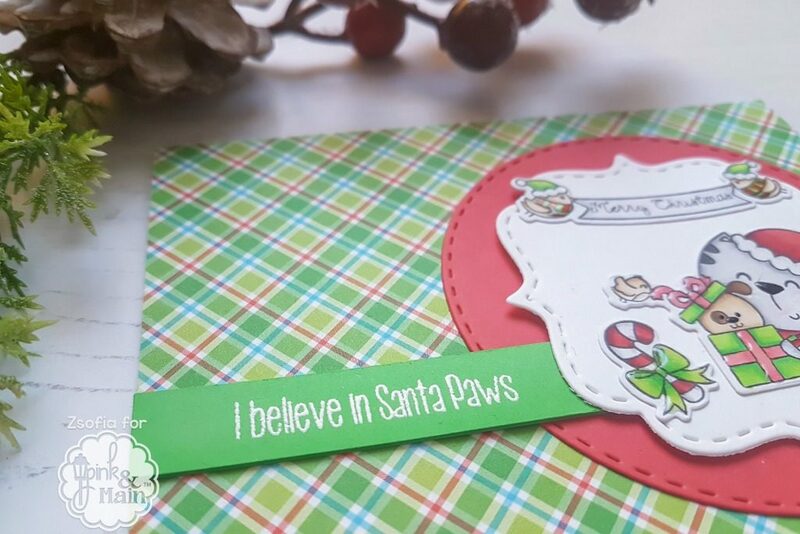 Then i die cut a stitched circle from red and green cardstocks and also 2 white pieces with a Stitched Top Note die. 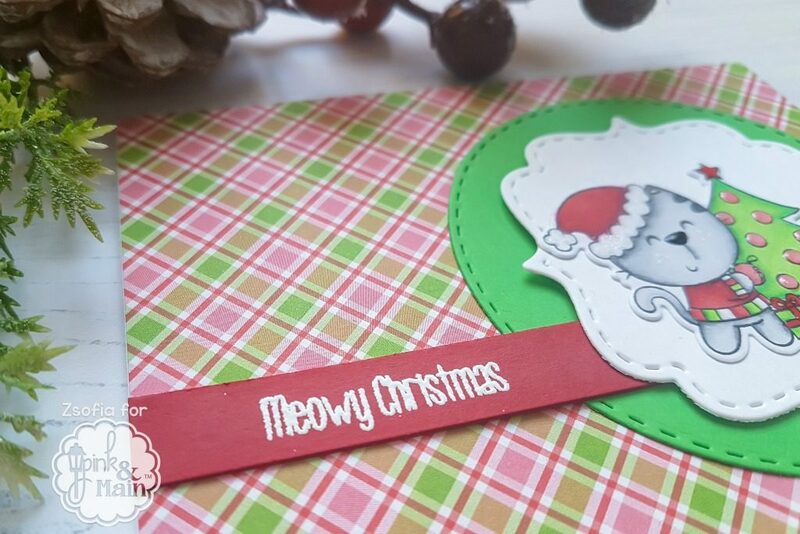 I white heat embossed 2 of the sentiments from the stamp set on thin strips of red and green cardstocks and layered them over another 2 cardstock strips for a dimensional look. 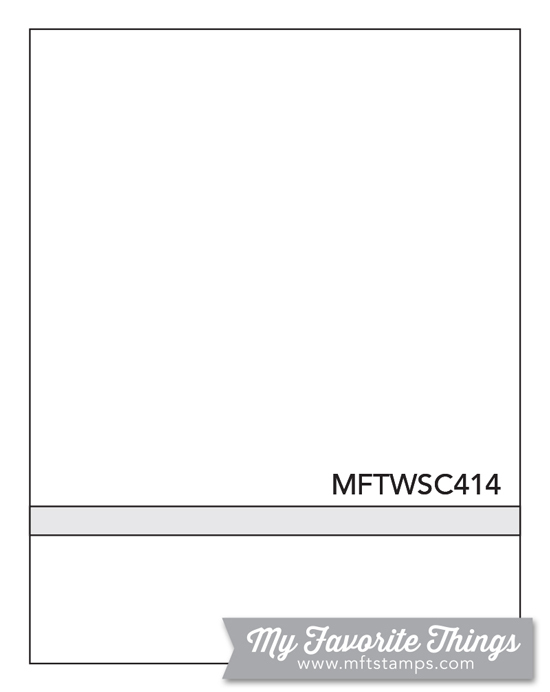 Apart from this my card is pretty flat this time, so it is gonna be easy to mail. I hope you enjoyed today’s inspiration. I have used up a lot of my patterned papers so i am off to the Pink and Main store to replenish my stocks while they have the “Buy one get one free” deal! I had this cute card yesterday on the Pink and Main blog, so I thought I would share it with you here as well. 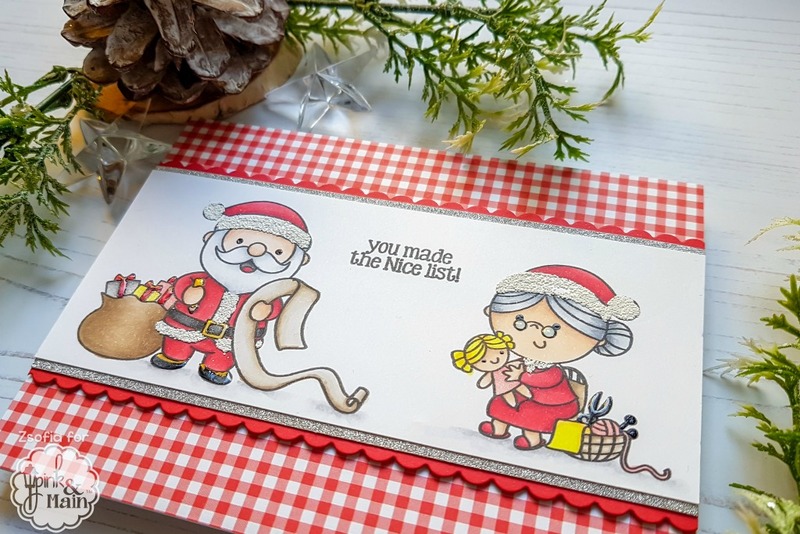 The images in the Nice list stamp set are just adorable, I love this set so much and I see myself re-making this card with even a Hungarian sentiment on it for my friends for Christmas. I started with a strip of smooth white cardstock which is good for alcohol ink colouring. I stamped Santa and Mrs Santa on the 2 sides an after masking Santa with a post-it mask, I stamped the bag too full of presents. I also stamped the sentiment at this point. Then I used my Copics to add colour, but you can use any colouring medium you prefer if you want to re-make this card. 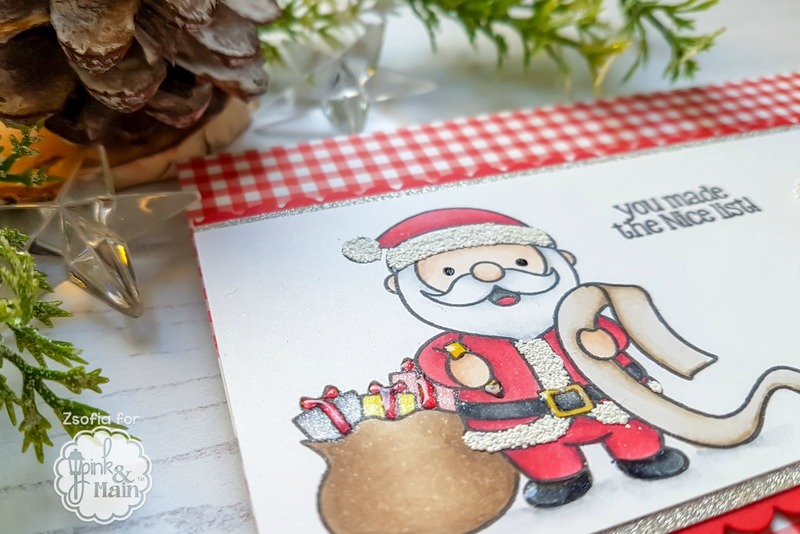 I used a bit of clear shimmer on the presents and also a Versamark pen on the Santa suits and hats to be able to heat emboss these parts with a White Puff embossing powder. I love the fluffy look, it looks so cozy! I covered an A2 sized side-folding notecard with red gingham patterned paper from the Jolly paper pad. I matted the coloured piece with silver sparkle cardstock and cut 2 scalloped borders from red cardstock to add it under. I mounted this with 3D foam tape onto the background and finished it off with a bit of glossy accent on the boots and glasses. 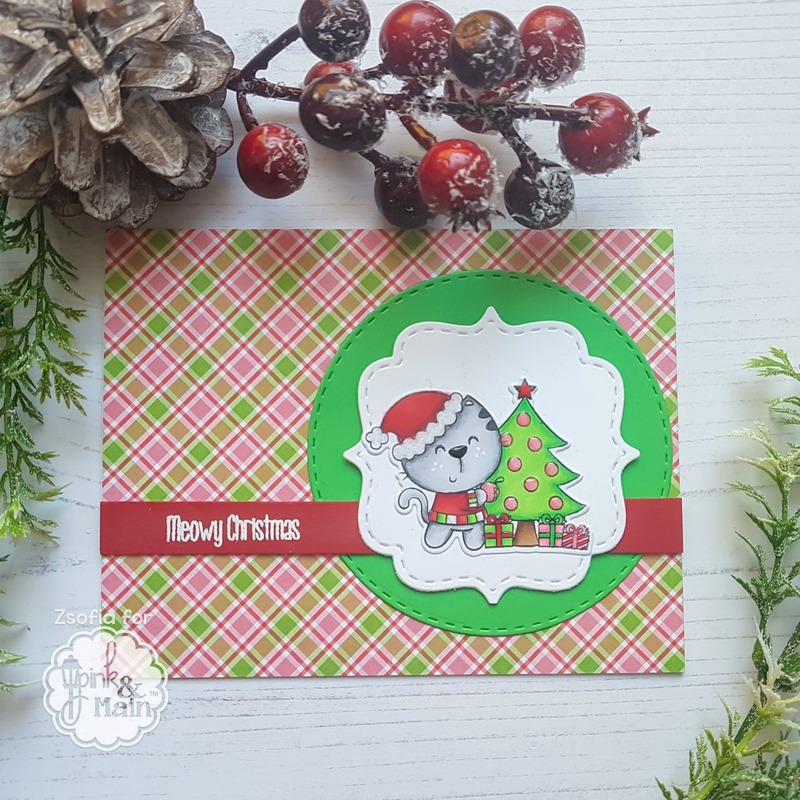 I will upload this card to the Simon Says Stamp Monday Challenge Warm Winter Wishes. I hope you like my card and got inspired! 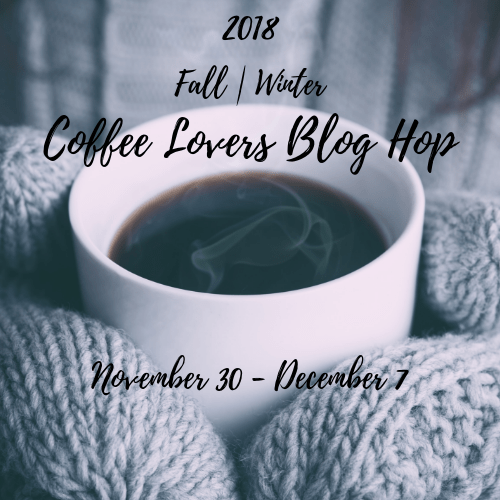 Please make sure to subscribe to my blog in case you like what you see, just to make sure you will not miss any of my inspirational posts. I plan to bring many more holiday cards until Christmas! 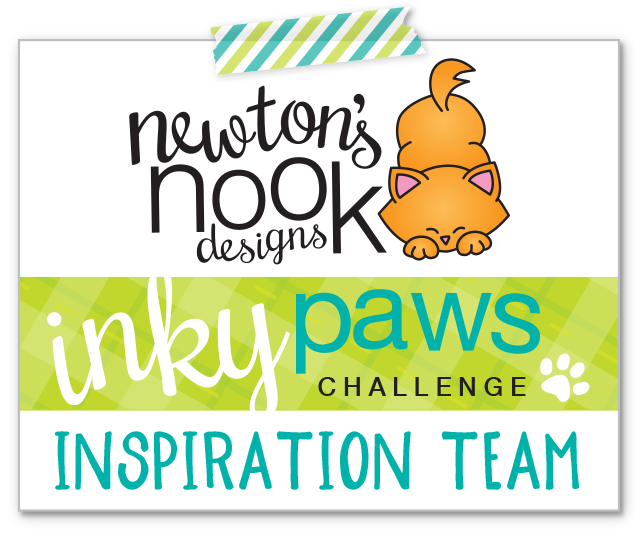 It is my second post today as I was longing to play along the MFT Sketch Challenge #414. It has been a while and I missed using my MFT goodies. I came up with a design I could multiply – I actually made 4 cards at once, 2 in English and 2 in Hungarian (not on the pics). I started with a stitched rectangle cut from light blue cardstock. 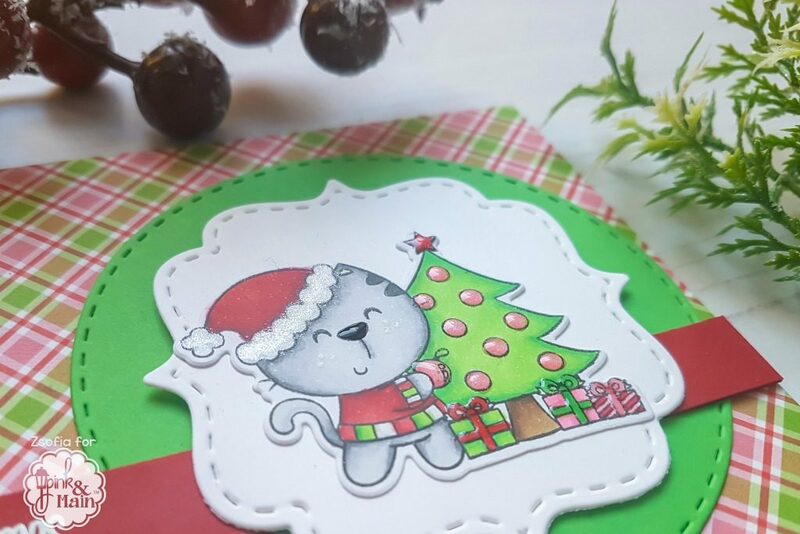 I used the Snowfall Background stamp to heat emboss on it with WOW White Puff embossing powder. Then I stamped, coloured and die cut the images. I used Copics and kept it very simple. After die cutting I used an embossing ink pen to cover some parts of the suit and hat with embossing ink and used the same white puff embossing powder to add more texture. I love how it turned out! I also added a piece of blue gingham pattered paper to the bottom, and heat embossed the sentiments on a thin strip of dark grey cardstock with white embossing powder. I assembled the card using liquid glue and mounted it on a white top folding card base. 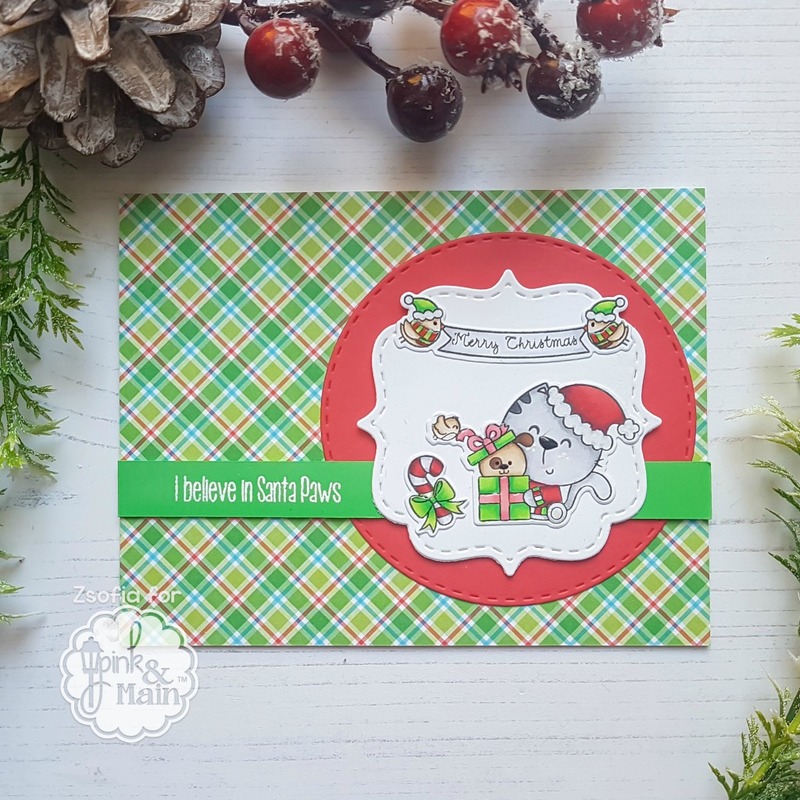 I am so happy with this cheerful design, I hope I can make even more multiples of it before Christmas! I will link this up to the MFT Sketch Challenge. Hope you like my card and will return tomorrow for some more cuties! I stamped and silver heat embossed a bunch of poinsettia images from the gorgeous Poinsettia Blooms stamp set. I used my Zig Clean Colour Real Brush markers to add a touch of colour and used a clear shimmer pen to move it around. In this way I needed only on shade of each colour and still get the effect of a professionally coloured flower 🙂 I could also vary the colours I used, so even if the design was the same I did not get bored with it. When they were all dry, I used the coordinating dies to cut them out. I also die cut the rounded rectangle from the Frames and Flags die set from a thick white cardstock. 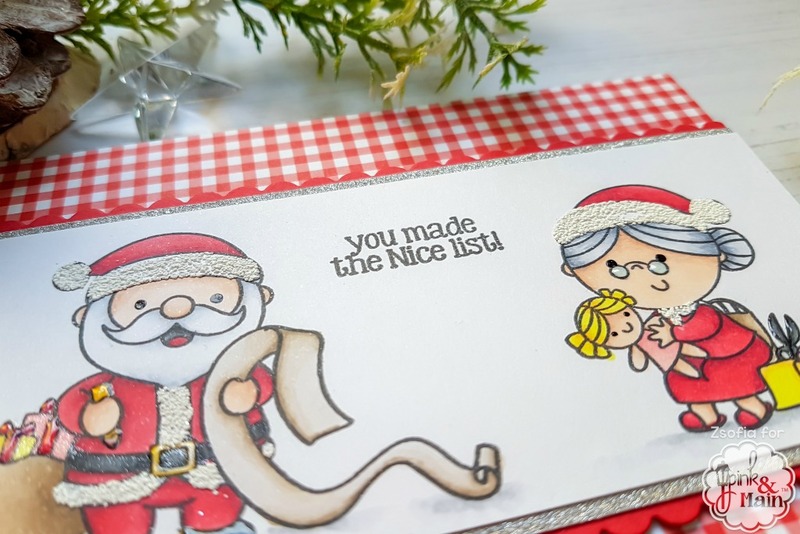 I used the sentiments from the Poinsettia Blooms stamp set but you can easily add variation by choosing sentiments from other sets too. I silver heat embossed them on the bottom of the rectangles. I used 3D foam squares to add the flowers, 3 on each panel. Then I added a matching thin mat and mounted it on a white card base which I previously covered with some sparkly wrapping paper. I like to recycle my wrapping papers if they are pretty! I will upload this project to the Simon Says Stamp Monday Challenge (Warm Winter Wishes) an Wednesday Challenge (Wrap it up). I hope you enjoyed today’s projects and will return soon for more inspiration.